ARETHUSE GEOLOGY is a growing service company, providing a complete range of services, from exploration to resources estimates. We have a significant operational experience worldwide, in particular by occurring on numerous mining projects with exposure to a wide spectrum of geological and geographical environments and contexts, and different types of deposits. The high quality technical work is the fundamental foundation for success: ARETHUSE implements its mining exploration and development projects with the same philosophy. 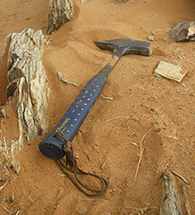 Our team combines skills in geology, geophysics and geochemistry and can address any challenges from grass-roots to resources estimates and mining geology. We are competent persons for JORC, and realised a lot of NI43-101 technical reports. ARETHUSE has a necessary industrial vision of mining exploration, and works on every sizes of projects. Our background includes works for private enterprises, from major mining houses to junior explorers, as well as governments and the European Union. This allows us to understand the needs of young ventures from the early beginnings to large mining projects, and related heavy infrastructures.